On April 20, 2007, travel arrangements were made to fly to Harlingen, Texas. 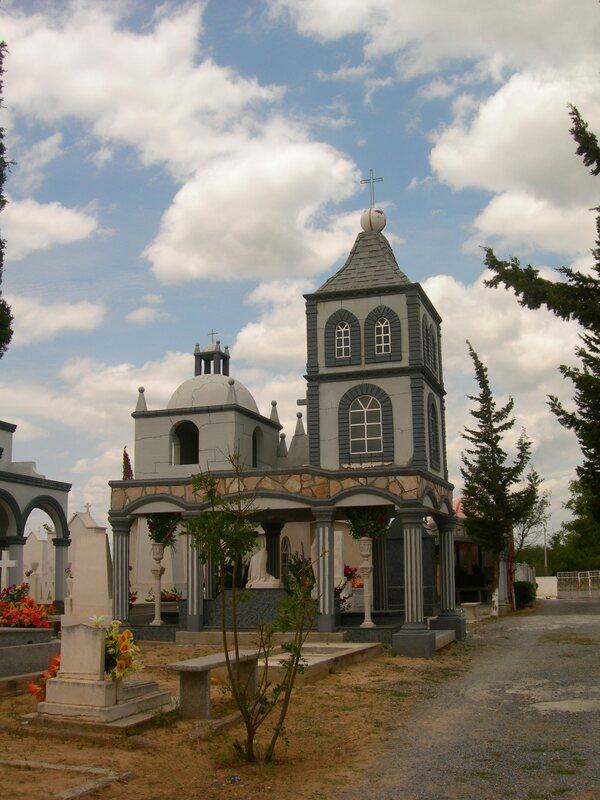 This quest was made to find the home in Ciudad Mier, Tamaulipas, Mexico of my Great Great Grandfather and his wife. Their names were Miguel Barrera Guerra and Encarnacion Guerra Pena and her sister, Salome Guerra Pena. 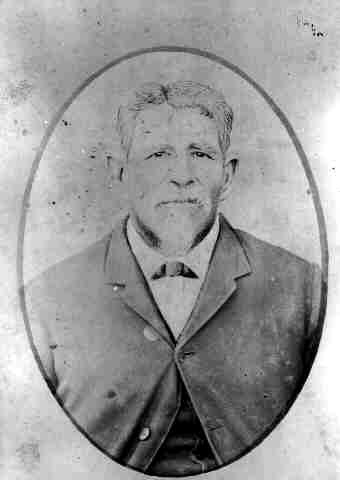 Miguel Barrera Guerra (1841-1921) was a man whose ancestors had been founders of Ciudad Mier and his 2nd wife, Encarnacion Guerra Pena (1846-1882) ancestors had also been counted in the first census. 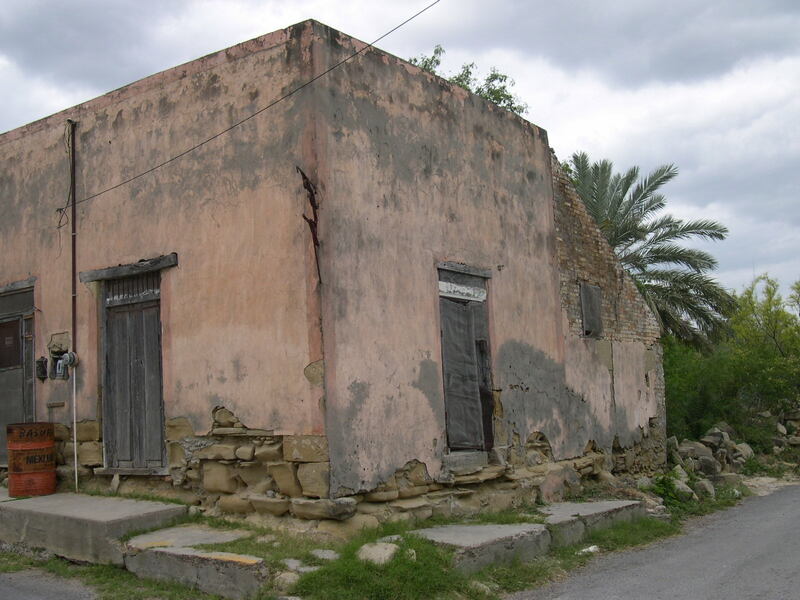 The town of Ciudad Mier had been formed not far from Camargo, Nuevo Santander because the Catholic Church was protecting the Indians that were stealing livestock for food from the settlers herds. The flight to Harlingen, Texas took only an hour and I was met by my cousin and his wife, Larry and Linda Garza. 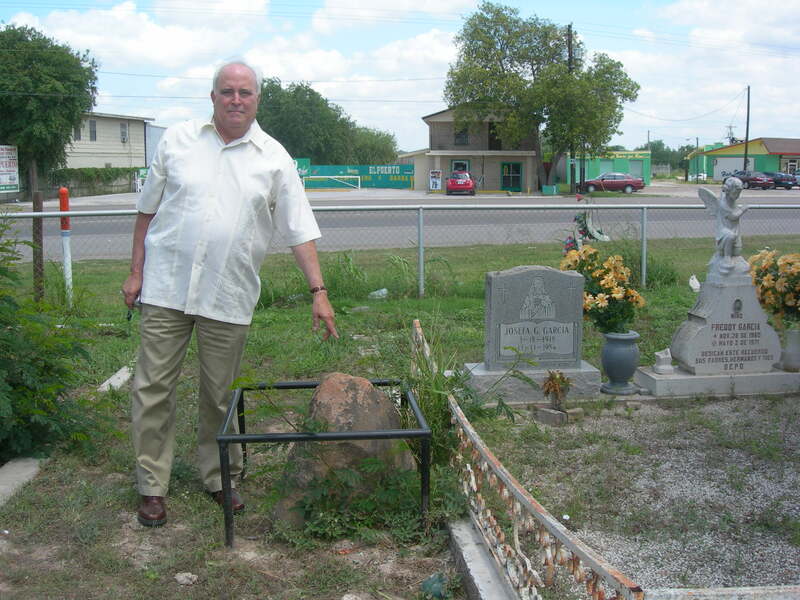 We were to spend the night at the home of his aunt and uncle, Mary Rose and Renato Cardanas in Brownsville, Texas. Their kind reception and accommodations were wonderful for someone that had only been described as a cousin of Larry and they didn’t know that we shared Miguel Barrera Guerra as a great great grandfather. The next morning a trip was started toward Roma, Texas to cross the border to Mexico at Miguel Aleman, Tamaulipas and to the interior about 10 miles to Ciudad Mier. We also would have the Curator of Casa Mata Museum from Matamoros, Carlos Rugerio which could give us directions and introduce us to the former Mayor of Ciudad Mier, Professor Enrique Maldonado Quintanilla. After two stops we arrived at Rio Grande City, Texas and visited the Immaculate Conception Church and the Our Lady of Lourdes Grotto. In October 1924, Father Gustave Golleach arrived in Rio Grande City and later he envisioned building a grotto similar to the one in the south of France. He built it himself with help sometimes from Baptist Ministers with rocks and petrified wood from a forest that had existed near the surrounding areas of Escobares, Texas. It took 14 months to complete and was dedicated on April 12, 1928. The statue of the Virgin Mary is 7feet tall and was purchased from a studio in Paris, France. 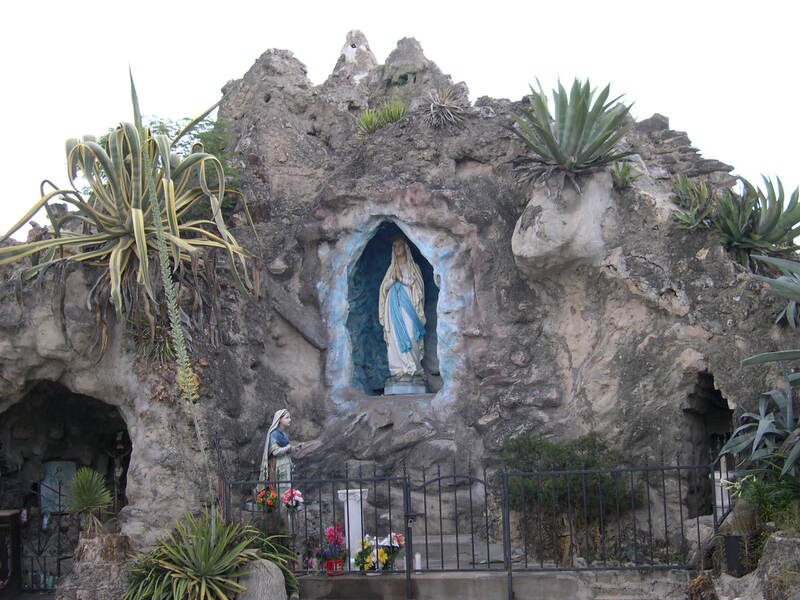 The grotto is 33 feet high and 90 feet wide and was built with a cost at the time of $15,000.00. There is also a beautiful outdoor Stations of the Cross just west of the grotto in beautiful condition. My cousin, Larry Garza related that he use to come play here as a child and it brought back many memories to him to visit the Grotto. 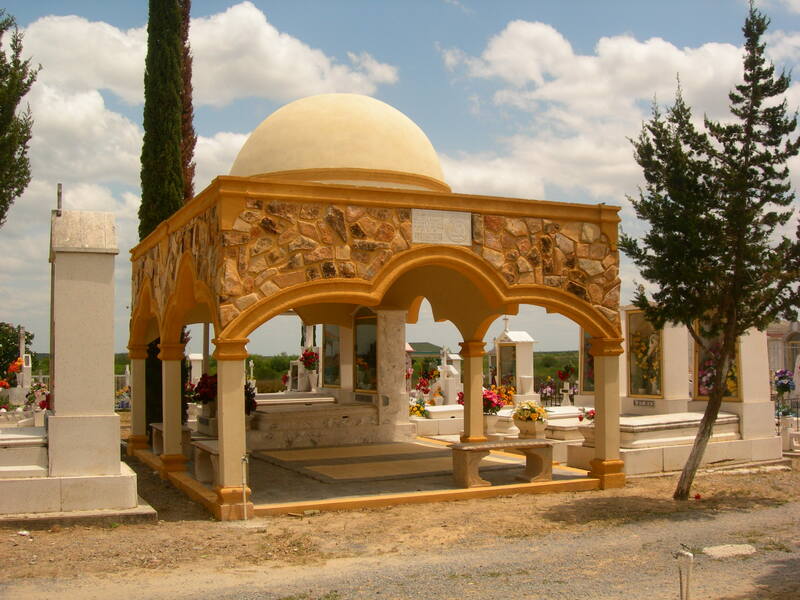 Our next stop was the cemetery in Roma de los Saenz, Texas to visit the grave site of Larry’s family that had his grandfather, grandmother, aunts and father buried. 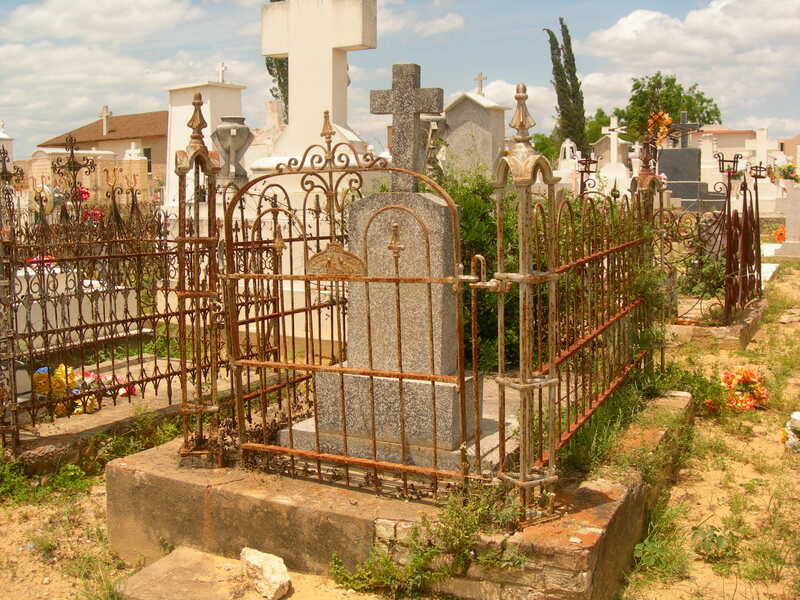 At this cemetery there was a large brown rock that had a steel fence around it. It was a boundary marker from ancient times of the awarding of the Porciones by the King of Spain to the settlers of Mier. It is called a Mojonera. This marker was the boundary of Porcions 72 and 73. Porcion 72 was awarded to Juan Angel Saenz and to the east Porcion 73 was awarded to Miguel Saenz. I would be wonderful to decipher what the meanings are on the rock. 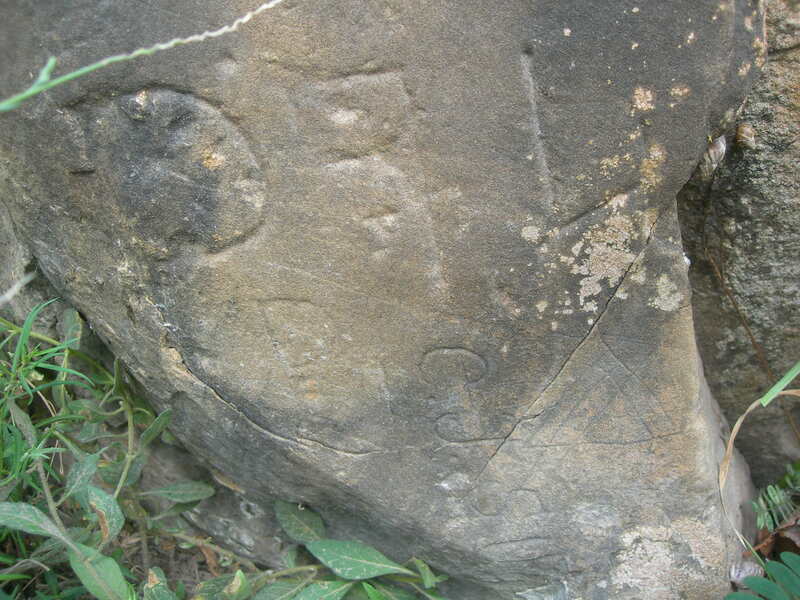 Part of it looks like intersecting lines that would mark off the different Porciones but it is not really very readable since it has been inscribed 250 years ago approximately. In a discussion with a knowledgeable person another Mojonera was found in Duval County, Texas and it was believed to be pointing to a buried treasure because it had an arrow pointing in a certain direction but this was only a boundary marker. In Duval County, the Mojonera also had a carving of the rancher’s cattle brand, it was determined. The Porcion 72 would extend to the west into today’s Roma, Texas. Porcion 72 was about 5756 acres and Porcion measured about 6049 acres. These Porciones were laid out with chain marking instruments between two rods and were long, narrow conveyances to allow all of the settlers to have water access to the Rio Bravo or as we know it today as the Rio Grande River. Captain Don José Florencio de Chapa, married to Doña María Margarita de Peña, has ten children, all arms, ten horses, five male donkeys, four female donkeys, and thirteen servants. Don Manuel de Hinojosa, married to Doña María Inés de Chapa, has all arms, fifty horses, five donkeys, two orphans, nine servants with twenty-three persons. *Doña María Rita López, widow, has six children and ten horses. Doña Ana María Guajardo, widow, has one son and one servant, six male donkyes and two female donkeys. *Don Francisco Guerra, married to Doña Josefa de la Garza, has nine children, all arms, twenty horses and two female donkeys. Don Javier Salinas, married to Doña María Longoria, has three children, all arms, ten horses, and two donkeys. Don Manuel del Bosque, absent with permission, bachelor, all arms, fifteen horses, two servants with seven persons, and two donkeys. *Don Gaspar García, married to Doña María Gertrudis Barrera, has five children, all arms, ten horses, and one donkey. Don Cristóbal Ramírez, married to Doña María Matiana de Hinojosa, has eight children, all arms, twenty horses, six donkeys, and four servants, one married; two children. *Don Pedro Regalado de Hinojosa, married to Doña María de Peña, has three children, all arms, and six horses. Joaquín Bazán, married to Manuela González, three children, arms, four horses, and one donkey. Don Nicolás González, married to Doña Ana García, nine children, arms, six horses, and one donkey. Don Manuel de Hinojosa, the younger, married to Doña Juana Sánchez, has two children, arms, and fifteen horses. Don Ignacio Gutiérrez, married to Doña María de Hinojosa, two children, arms, ten horses, one donkey, and two servants, one married, three children. Don Andrés García, married to Doña Clara Farías, all arms, twenty horses, one donkey, and one servant. *Don Miguel Sáenz, married to Doña María de Hinojosa, has two children, arms, and twelve horses. Don José Peña, married to Doña Ana López, has two children, arms, ten horses, one male donkey, and two female donkeys. Jose Bazán, married to Ana Salinas, three children, all arms, ten horses, and one donkey. Alfonso García, married to Doña Tomasa de la Garza, has six children, arms, and eight horses. 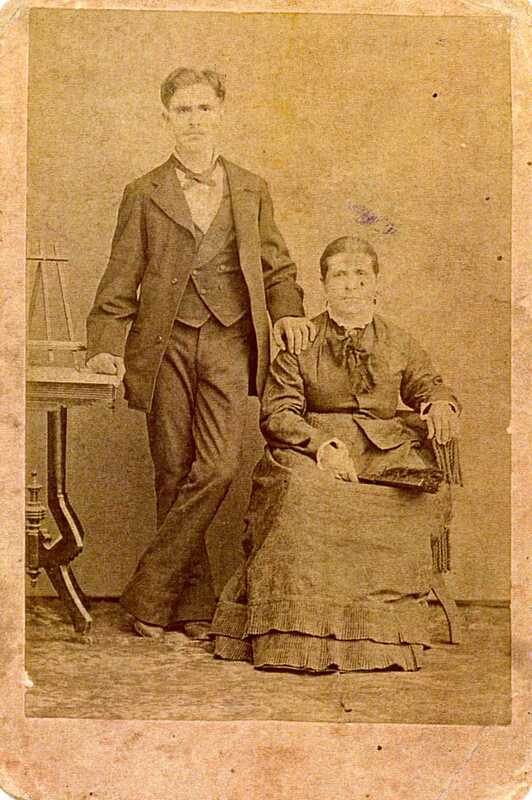 Lazaro Vela, married to María García, seven children, without arms and four horses. Don Juan Antonio Ramos, married to Doña Ana Anzaldúa, five children, six horses, one servant with a daughter and his wife. Don Juan de Dios Garza, married to Doña María Ramírez, two children, arms, and fourteen horses. Pablo de Zárate, married to Juana Bazán, one daughter, arms, six horses, and one servant. Don Diego García, married to Doña María Salinas, all arms, and four horses. Don José Félix Recio, widower, has three children, arms, and four horses. Alejandro García, married to María Vela, arms and five horses. Diego Pérez, married to Rita García, four children, nine horses, and without arms. Don Bernardo Vela, absent with permission, married to María Peña, four children, arms, and five horses. Antonio García, married to María Benavídez, has one son, six horses, and without arms. Don Pedro Ramírez, married to Inés García, one daughter, three horses, and without arms. Don Jose Manuel Alviño, married to Juana Montalvo, has four children, arms, and two horses. Don Jose Ramírez, married to María Peña, one son, arms, six horses, and one donkey. Don Ascencio [sic] Farías, widower, three children, arms, and six horses. Jose Alanis, married to María Guadalupe, one son, arms, and six horses. Juan Pantaleon, married to Antonia Ramírez, two horses, a rifle, and knife. Don Francisco Gonzalez, married to Doña Francisca Salinas, two children, arms, and eight horses. Don Juan Francisco Saenz, bachelor, all arms, and four horses. *Don José Ramón Guerra, married to Doña Rosalía de Hinojosa, has three children, arms, four horses, and three donkeys. Luis García, married to Tomasa Solís, two children, two horses, and without arms. Don Francisco de Landa, absent with permission, married to Doña Antonia Hinojosa, has two daughters, all arms, ten horses, and three donkeys. Many of these first settlers had been somewhat related as brothers and sisters, cousins, fathers and mothers of each other. 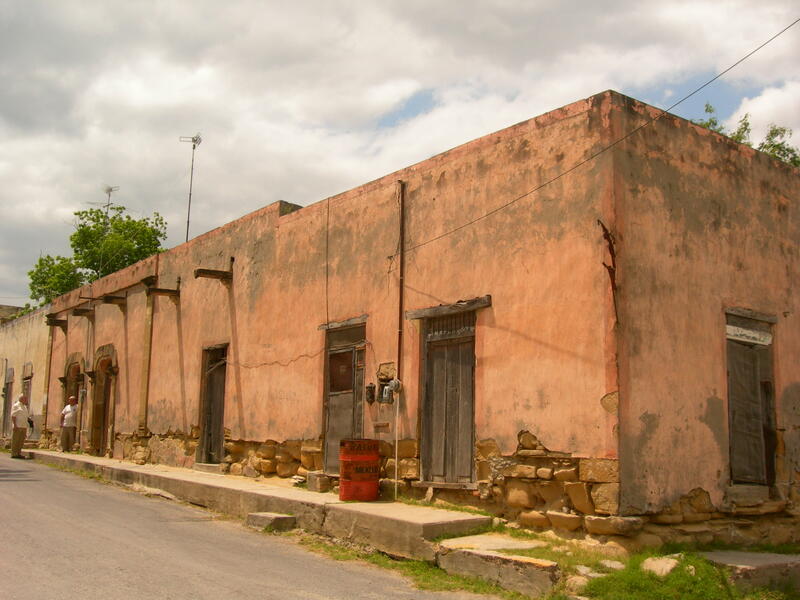 There were also relations with other settlers of Reynosa, Camargo and Revilla, the neighboring towns. Families had come from Cerralvo, Monterrey, Camargo and Cadereyta to settle Mier. Research on these families had lead us to know that parents and ancestors of Encarnacion and Miguel had lived here for 250 years. Sacraments of Baptism, Marriage and Death had been performed in Mier and recorded in the church records. Residents might have lived outside the town of Mier but they would return and have their sacraments performed and recorded there. 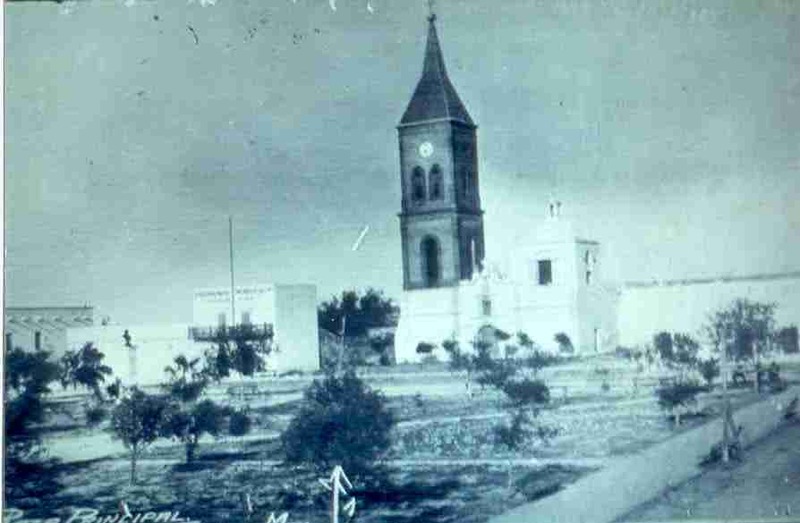 On previous trips to Ciudad Mier the author had visited the church and to know that ancestors had been there for that period of time gave a wonderful feeling. 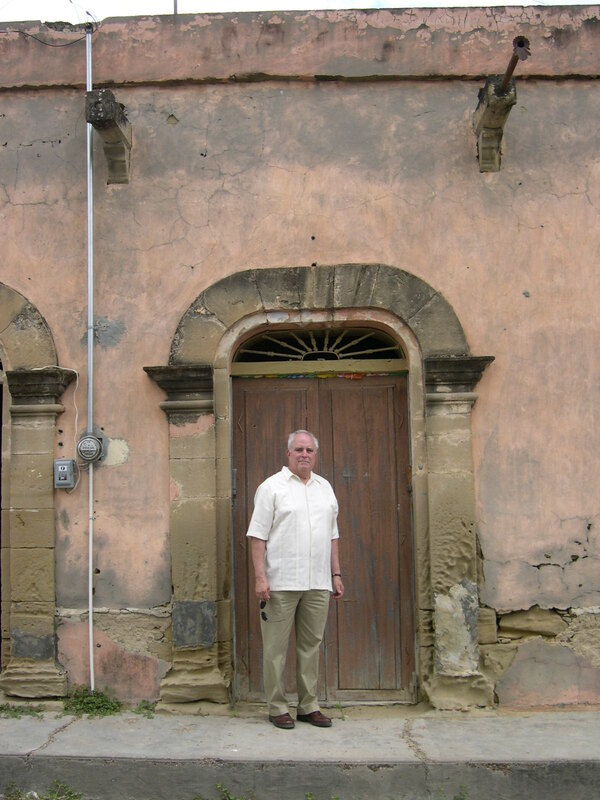 As we arrived in Ciudad Mier our group went to find the former Mayor, Enrique Maldonado Quintanilla, who would help us locate the house we were looking for. Upon arrival to his home, his wife told us that he had waited two hours for our arrival and had gone out to the Restaurant Siete Mares. There we found him and he directed us to the Cemetery in Mier. This was a beautiful site, very clean and well kept by the workers. 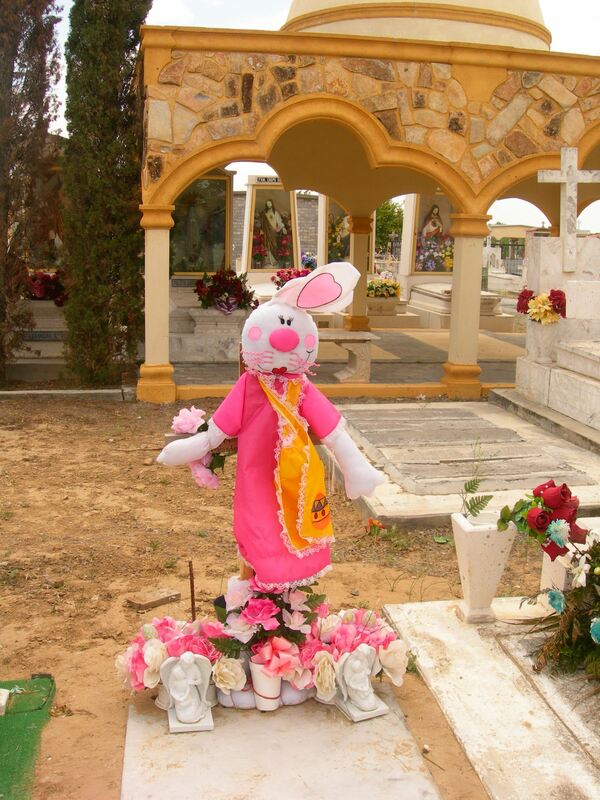 Unlike previous search trips to Camargo, Tamaulipas principal cemetery, there was no grave depredation in Mier. The cemetery overlooked a valley below the hill it was situated on and green vegetation in the valley was very evident. The grave markers in the cemetery provided the most beautiful evidence of love and honor for the dead that is prevalent in Mexican tradition. The Day of the Dead November 1 and 2, we were told, the cemetery is decorated very beautiful. 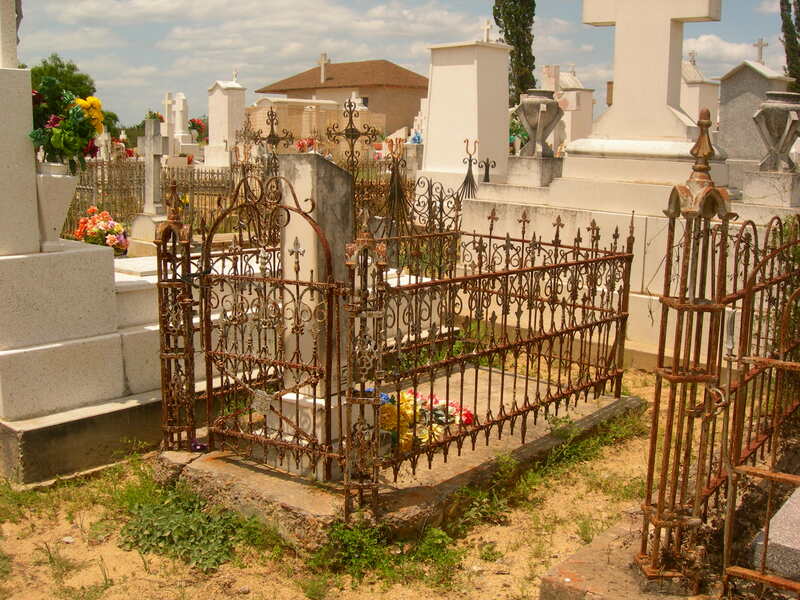 Graves are dug and lined with concrete, brick and covers are laid on top to be to be decorated later very extensively if the families are able to provide the resources and work. Names evident in genealogical research of Mier are everywhere to be found. Guerra, de la Garza, Barrera, Bazan, Perez, Hinojosa, and Gonzalez are a few of the names we saw on the graves. 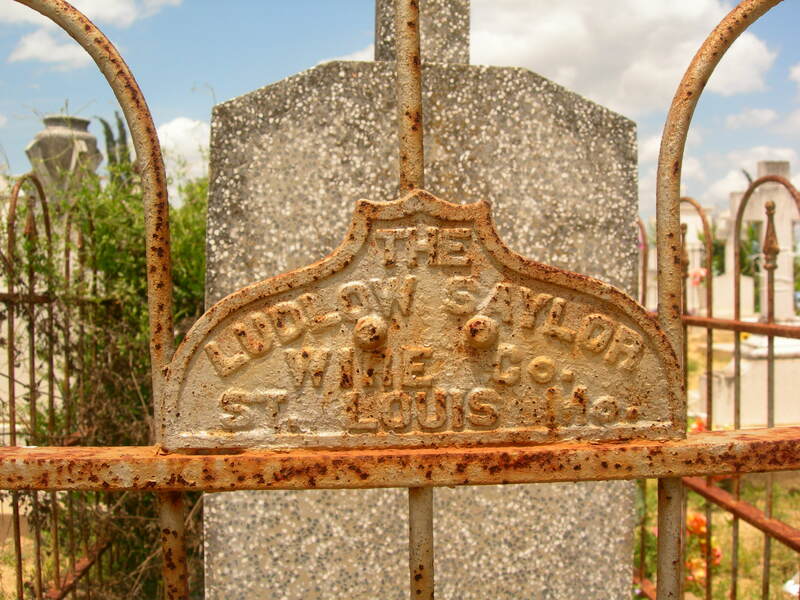 The more we walked around the cemetery, the more we were astounded by the beauty of markers. Pictures, toys, statues, marble, tile, colored glass and metal work were everywhere. There was no trash spewed in the cemetery and the parking lot was huge about an acre in size. During the month of April the weather was cool and it was very pleasant to walk around see the sights. Our guide, Carlos Rugerio, was away from the group taking these wonderful pictures with his architectural background for the details of the markers. When his pictures were made available to this author, I was astounded with his work and received permission to use them in our article. 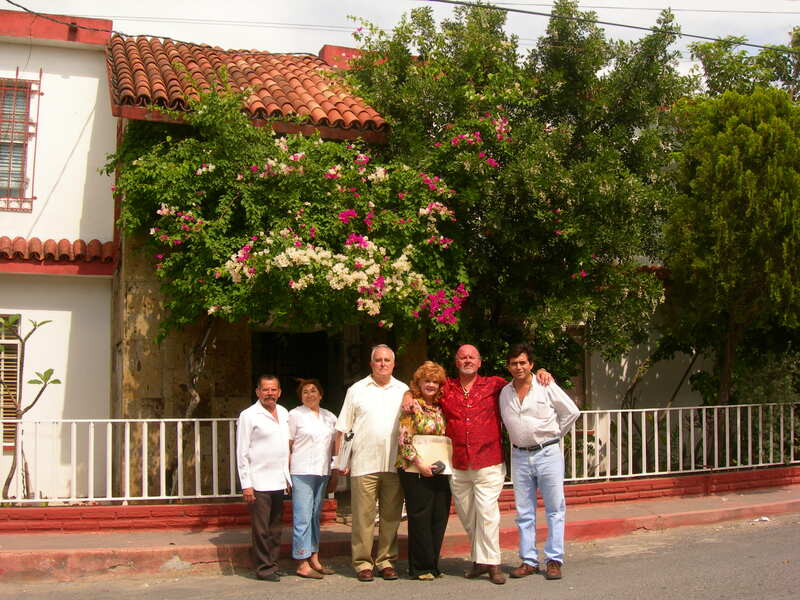 We finally traveled to the center of Ciudad Mier to find the house of Miguel Barrera Guerra and Encarnacion Guerra. The house was situated on the street named after one of their sons, Major Enrique Barrera Guerra, killed in the Mexican Revolution, who was the great grandfather of Larry Garza. Enrique Barrera Guerra’s brother, Coronel Miguel Barrera Guerra, Jr. had the street just north of his named after him. The house is half a block long and colored a dull pink at this time. There were two families living in the house at this time and one of the residents allowed us to enter the house and inspect where the family had lived. A beam (Viga) had the inscription “Casa de Encarnacion Guerra 30 Junio 1869”. It is believed that date is when the home completed and after seeing other pictures of dates inscribed on beams, it must have been a custom to mark them as such. The beams were approximately the size of 4”x12” lumber and Professor Maldonado told us they were some kind of Douglas Fir lumber. Maldonado also said these timbers were brought up the Rio Grande River during the time after the Civil War. Knowledge of the lumber industry tells us this lumber came from California, Oregon, Washington areas because Fir is native to those western states and not Texas or Louisiana areas. The boats that traveled up the river from Port Isabel to Mier were owned by Richard King and Mifflin Kenedy who purchased the boats from the armed forces that owned them during the Mexican- United States War. 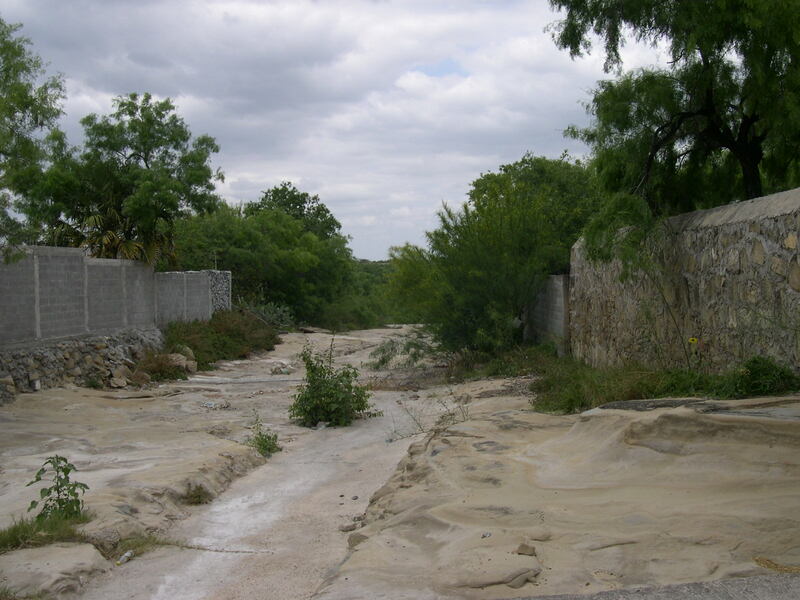 Family oral history tells us that Miguel Barrera Guerra owned carts that carried goods from the river to Ciudad Mier. 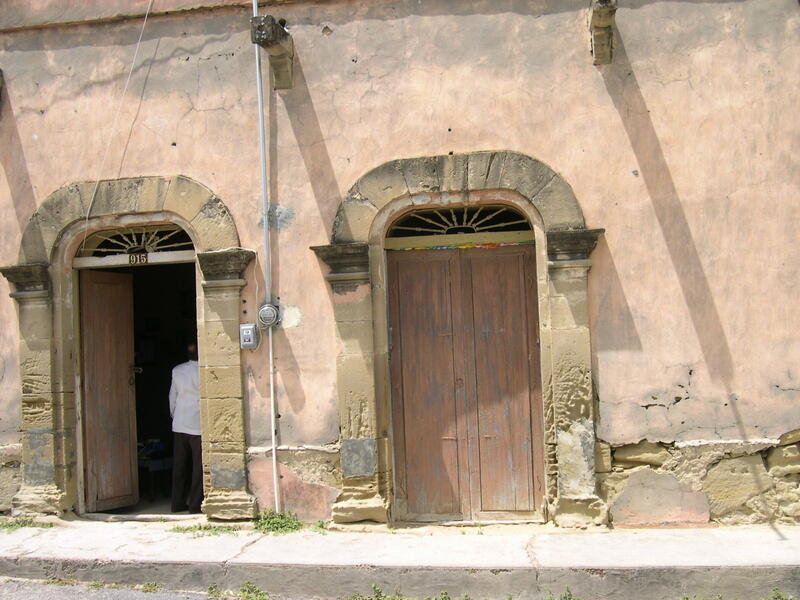 This commerce undoubtedly, allowed Miguel to build such a large house and become a leading citizen of this town. The house has wooden floors and is in disrepair mostly in the kitchen area. The kitchen with its fireplace has a roof that is falling down. 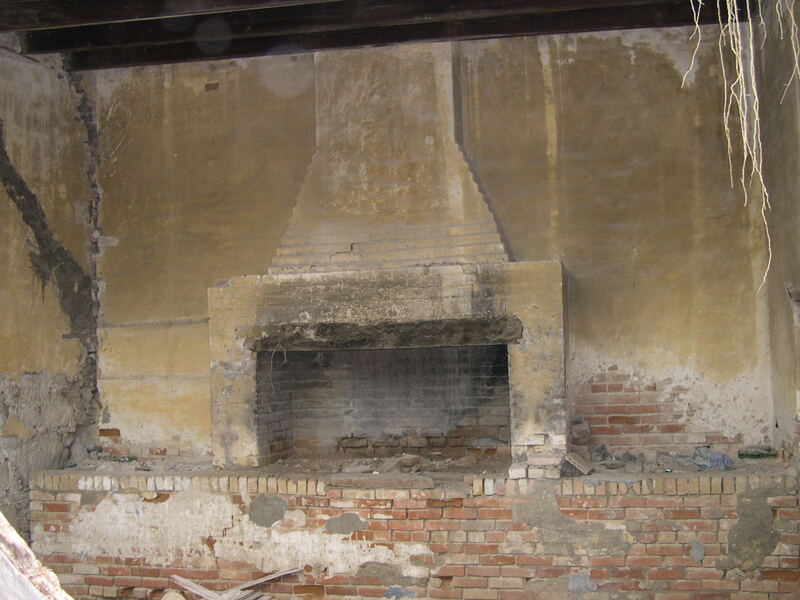 But the entire wall that has the fireplace is about 16 feet long and is still standing showing its strength and importance to the family during those times. 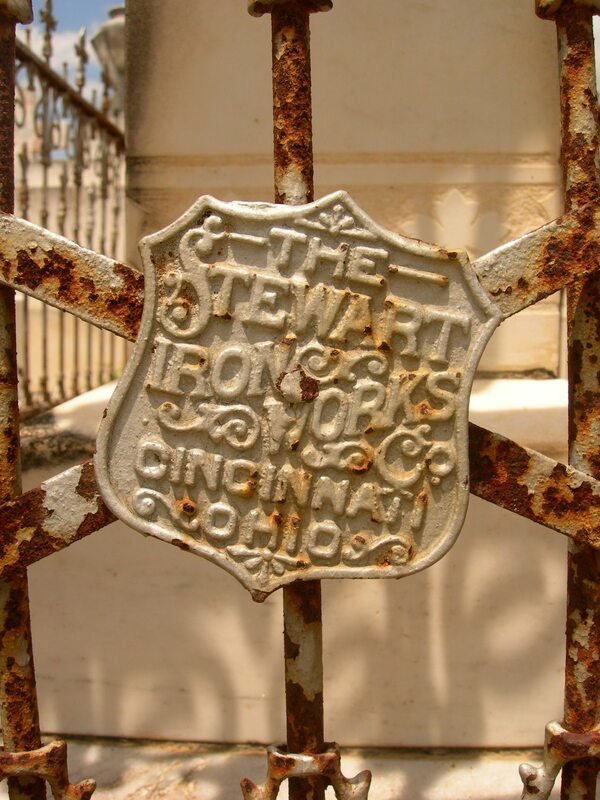 A wrought iron grill was in the room that was probably used to cook and have a fire under it for that purpose. There was an animal smell in that room and I suspect that maybe goats or dogs were kept there today because it had a temporary fence in the doorways. The arched columns in the various exterior doorways appear to be carved from a form of sandstone that have withstood the ravages of time but one can tell maybe running water and wind have damaged the stones. The bottom two layers of stones have eroded away and I am thinking because the Alamo River bed is behind the property that during storms or when there was more water before Falcon Dam construction it flooded and wore away the rock layer. The walls appeared to be at least 12”- 24” thick. Outriggers for water deflection during rainy times are still evident and in keep the falling rain off the walls from the roof. A number of outriggers or drains had pipe inserted to further keep the running water away from the walls. In some rooms a lone light bulb was the only light source for the room. The air passage above the doors was open to ventilate the rooms and hopefully during the winter time they would be blocked to prevent the cool air from coming into the house. It has been 3 generations since the house has been in the immediate family and a request was made to find the current owner or owners. The owners were located and the offer to sell the house was much too high for consideration. It was thought to maybe purchase the house and bring it up to current standards while still maintaining the integrity of the colonial style. There would be other considerations to be made as could the person who claimed title is really the titleholder and also obtaining materials to bring it up to standards. A contractor in the area would have to be hired also to oversee the job correctly. If those barriers were eased maybe it would be possible but for now it was wonderful to find the house and be able to walk inside of it was a great privilege. Enrique Maldonado, Lazara Maldonado, Jose Guerra, Linda Garza, Larry Garza, Enrique Maldonado, Jr.
We thanked the Professor Enrique Maldonado and Arq. Carlos Rugerio for their help in this quest and hope to return to Ciudad Mier and explore the area another time.